‘Three’ is the new lucky number for the Las Vegas Senators. The Senators used the third inning to score six of their seven runs and pretty much slammed the door shut as they outlasted the Downey Waves 7-0 to claim the 45-over National title of the 2015 MSBL Kickoff Classic in Las Vegas. 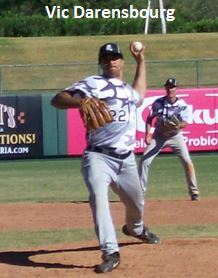 Vic Darensbourg was the winning pitcher while limiting the Waves to no runs and a miniscule five hits while striking out nine along the way. The third inning started out pretty good for the Waves with a ground out to second base for the first out. Unfortunately for them there was a next batter. Eight hits, 12 batters and six runs later the game was pretty much over before it began as the Senators sent the deadly dozen batters to the plate. Essex Burton led the way for the Senators from the leadoff spot by going 2-4, including a home run in the seventh. Vic Darensberg was 3-5 with three singles and a run scored in the big third inning. On a side note, veteran MLB player Jose Canseco strapped it on for the Senators on the first day of their pool play. It appears that Jose can still play the game. “He hit a line drive to the fence that one-hopped and didn’t get more than 12 feet off the ground. Somebody could get hurt out there,” explained Hernandez with a chuckle.